“Nordic” in this case could be Scandinavia (Denmark, Sweden, Finland, Lapland and Norway) or northern Germany (which belonged to Denmark at times) or even the Baltic region – the marks are not consistent with official markings of the time and would point to a region more isolated from a guardein, or silver warden. Stylistic identification is the most reliable source, speaking to the straight form of the handle and its down-turned tip, and with its suggestion of a rib carried from the earlier Hanoverian type. 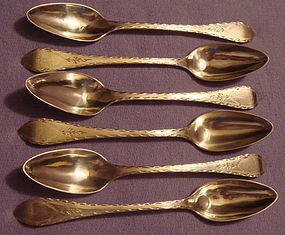 The graceful elongation of bowls found in late 18th and early 19th century Scandinavian flatware as well as decorative elements found in other European silver from the last third of the 18th century are all to be found in these spoons. Bright cut edging of the handles encloses a zigzag engraved line which also encloses a cartouche. Foliage hangs from the cartouche which contains lightly pricked initials, AFS over AMM. Maker marks appear to be ST and are struck twice under the upper end of the handle. I'm guessing that the bowls have been polished. Length is 5.75 in., weight for the 6 is 84g. Spoons in this quantity and of this age are unusual.